The new school year is upon us and it's time to think of a great gift for your child's teacher. Unfortunately, coming up with a good gift idea for someone you hardly know can be quite challenging. This is especially true if you're part of the 25% of the U.S. population that waits until the last minute to buy gifts (which we're all guilty of doing). 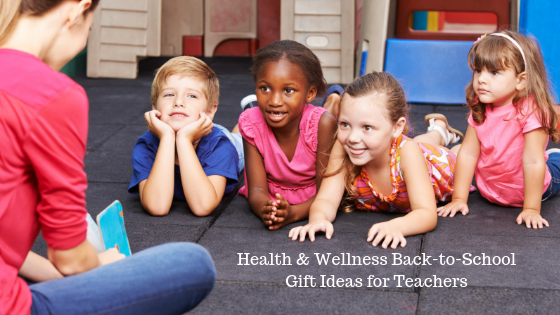 But you can never go wrong with buying health and wellness gifts for teachers -- so let's take a look at a few simple gift ideas you can put together quickly. It's no surprise that teachers can get sick pretty easily being surrounded by kids and their germs all day, every day. So what better gift to give your child's teacher than some cold and flu care essentials? Tissues, cough drops, herbal tea, and hand sanitizer can all come in handy if teachers start to feel unwell. And since cold symptoms can last up to 14 days, your child's teacher will be sure to appreciate having care products already on hand. Better yet, you can even put together some cleaning supplies, like wipes and sprays, to help them keep their classroom as germ-free as possible. Either way, these gifts are sure to come in handy during cold and flu season. After spending all day with a bunch of rowdy kids, teachers need to go home and relax. This is why a spa gift basket is the perfect gift for any teacher. Body lotions, nail care tools, face masks, exfoliating kits, and other bath and body products can all be put together in a nice basket and make the perfect gift. And with 87% of homeowners updating their shower during bathroom renovations, having some new bath bombs or sugar scrubs to use will be the icing on the cake. No matter if the gift basket is big or small, any and all teachers will appreciate having some new products to help them relax and pamper themselves at home. Teachers have one of the most stressful and tiresome jobs out there -- which means they need all the help the can get to stay stress-free. Giving your child's teacher some aromatherapy accessories can be a great way to help them de-stress when needed. Essential oils, along with diffusers and jewelry, can be a great way to allow teachers to smell their favorite relaxing scents wherever they are. Additionally, candles and other scent diffusers are always a great gift idea. Having these new aromatherapy items and accessories will help teachers remain calm, even on the busiest days at school. Buying a back-to-school gift for your child's teacher doesn't have to be a stressful experience. Putting together a few simple items that teachers could really benefit from, like health and wellness products, can be a great way to show your appreciation for everything they do for your child throughout the school year.